New Converse in Store Saturday 10.31.09. 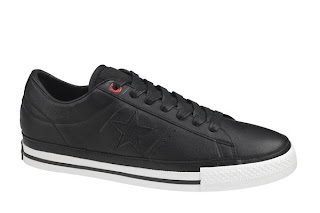 Converse has scheduled a 10.31.09 release of a premium offering of the classic One Star in collaboration with boutique Blends. The shoe features an entire upper of black deerskin leather, waxed laces, and the traditional Product (Red) eyelet. Internationally recognized, Blends is a landmark store for innovative street style, sneakers and designer collaborations. A pioneer of downtown Los Angeles’s Old Bank District, there are now locations in Costa Mesa and San Diego as well. A destination to style influencers from all around the world, its known for carrying the most sought after sneakers and coveted collaborations. Focusing on simplicity and minimalism, Tak Kato and Mike Toe are the co-owners and creative minds behind the store and the collaborators for the new Blends for Converse 1HUND(RED) Artists One Star shoe.